Thong Somboon Club offers safe, fun and adventure Activities for adults and kids alike. If you're looking for a fun day out for yourself, your friends or your family. With our staff's advice, you can ride ATV vehicles, take a ski lift, drive the luge, roll down a hill inside a plastic ball filled with water or lying on a huge inner tube, and much more. ATV Transverse our spectacular 1.400-meter course, full of fun twists and turns, while enjoying a safe, open-air environment. Let our staff assist you in learning to drive an ATV. Fun for the entire family, and all skill levels. B.B.Gun Want to test your aim? Line up and take your shot at one of our two BB-gun shooting ranges! Ready for the real thing? Gather your friends and head to our BB-Gun field where you’ll be suited up and split into two teams to determine the real winner! Buggy Ride Tired of going alone? These fun off-road vehicles have double seats. Judge each others driving, or just enjoy the company as you navigate the tricky track. Bumper Boat Enjoy the weightless feeling as you free float across the pool, or shoot water at others Try not to get too wet! Cowboy Studio Complete the western style at our cowboy studio where you can dress up and be anyone you want! It’s Cowboys versus Indians! Which part will you play? Dry Sleged Feel the rush as you slide back down a hill atop one of our many inflatable tubes! 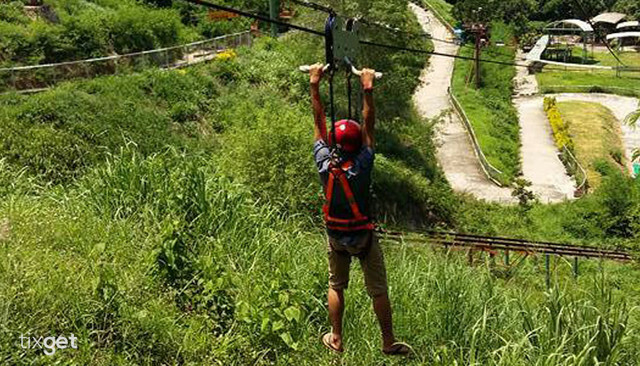 Flying Fox Love the rush as you soar 50 ft above ground on this scenic zip line. Not for the faint of heart or the weak of grip. Go Cart & Go Cart Kids Got to know who can really put the pedal to the metal? Show off your driving skills by circling our smooth course. Think you’re too young to ride? Think again. We offer another track for all those young and excited. 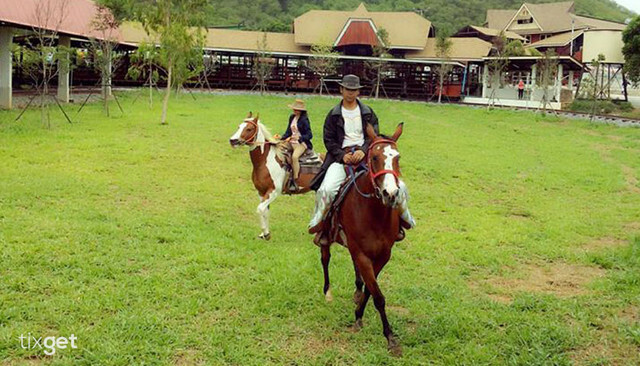 Horse Riding Allow our experienced staff to show you how to ride like a real cowboy on one of our many trained horses. Luge Enter one of our engine-less luge cars and steer your way down the twisty 650 m course. This is a safe and fun activity that anyone can enjoy. Once you’re done take the ski-lift back up to the top! Rolling Ball Enter one of our Rolling Balls, with a little bit of water added to make it more challenging. Race to the finish as the ball rapidly rolls downhill. Don’t fall!